Danielle Soucy Mills grew up in Massachusetts in a small city by the sea. Like the character in her book, she started gymnastics on the furniture in her home. She has since been involved in the sport for over 20 years, as a competitor and as a coach. At Rhode Island College, she exercised both her writing and gymnastic abilities before moving to California to earn her M.F.A. in Creative Writing from Chapman University. She is a SCBWI member and currently resides in San Diego with her husband, where she continues to coach gymnastics and write books for children and adults. 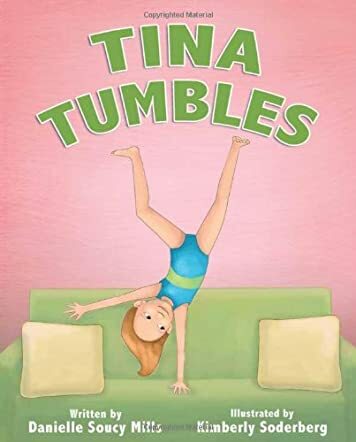 Written by Danielle Soucy Mills and illustrated by Kimberly Soderberg, Tina Tumbles is about a little girl named Tina who greatly admires the gymnasts she sees on television. All she wants to do is gymnastics and she tries her hardest to do the moves she has seen on TV, such as a headstand and a cartwheel, on the furniture in her home. However, it’s not as easy as it looks. She continues to fall and get disappointed. But, she never stops trying. Finally, it’s her first day at her gymnastics class and she is absolutely determined to succeed this time. The first thing that grabbed my attention about this book is the beautiful illustrations. Each and every page is full of realistic yet fun and colorful images that children will definitely enjoy. And the story by Danielle Soucy Mills is not only delightful and relatable, but it has an important message that children should learn. No matter how many times Tina fell, she got right back up and continued trying. She tried and tried until she accomplished her goal. Kids will see that hard work, dedication, and perseverance will lead to achieving their goals. Though it will certainly appeal to gymnastics enthusiasts, this book will be adored by children who have any interests at all because they will be able to relate to Tina. The stunning illustrations, the significant lesson, and the cute, entertaining story are all wrapped up in this wonderful book. Tina Tumbles is adorable, and I highly recommend it for parents to read with their children. I know I will be!